The apricot is one of, if not the, most ancient cultivated fruits in the epoch of human history!! Well, what’s that got to do with anything? 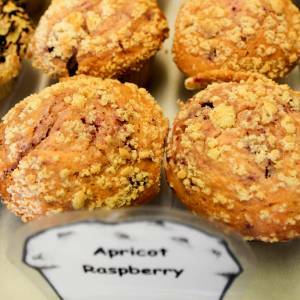 Easy, Frank Michaud has modeled his muffin on the complex of cave paintings found in Lascaux (Southern France) where he found what appeared to be a 17,000 year-old rudimentary muffin recipe making the most modern use of the apricot. This muffin remains a cave-man favorite, whether you’ve got one-eyebrow covering both eyes or are selling insurance.